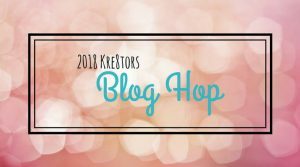 Hello and welcome to June’s Kre8tors Blog Hop. I am a Independent Demonstrator from the UK. As usual I am joining other Demonstrators globally to showcase items from the NEW Annual Catalogue which is now available from your demo. Or if you are a demo you will have been able to look at it since On Stage in April. You may have joined me from Laura and her fabulous project or am visiting me first. There are so many amazing products available in the NEW Annual Catalogue. Some new and some favourites. Today I am showing a project that I designed for a Team Share that was based on the Share what you love bundles which were available as a special in May but are available in the New Catalogue. 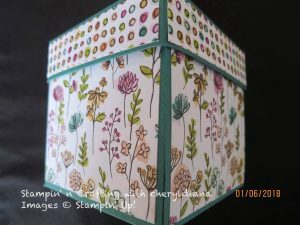 My project shows that you do not need loads of Stampin’ Up products to make a lovely candle in a box project. 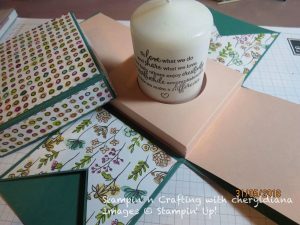 The card stock colours I used were Whisper White, Tranquil Tide and Petal Pink. I hope you like my project. Don’t forget to leave a comment before you hop to Rebecca and her lovely project. First I’ve seen of a candle in a box. Great project, Cheryl! Such an adorable project! I love 3D items and the little candle inside is such a nice treat for someone special! Thank you for sharing how to use some of the new products with us for our first month with the new annual catalog! Wonderful gift idea. I love that you let the designer series paper do all the work. It is so pretty and makes a beautiful box. This paper is so much fun! I have been using it and have not been disappointed at all. Great project! I love the use of DSP. Lovely project Cheryl (even though I had a sneak peak through our team tutorial swap).